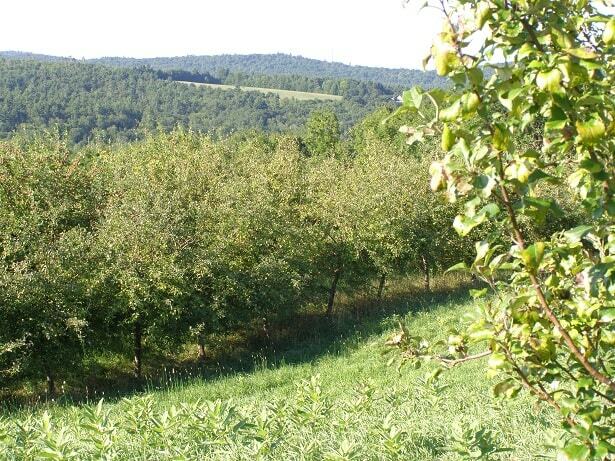 Three Rivers Land Trust (3RLT) Maine Farmland Trust (MFT), and the Town of Acton collaborated to protect 243 acres of fields, apple orchards and forestland on Goat Hill in Acton. The orchards have produced apples for the wholesale market for 80 years, and the hilltop has long been a cherished destination for year-round and seasonal residents of the region. “This complicated project has been three years in the making, but it is hard to imagine a better outcome,” said Adam Bishop, Farmland Protection Program Director at Maine Farmland Trust. When the former owners of the property decided to sell, many local residents worried that the property, with its expansive views, would be subdivided for residential development. Goat Hill is one of the highest elevations in Acton, and offers stunning 360-degree views of nearby lakes, the Presidential Range and Mt. Washington to the west, and to the ocean to the east. 3RLT, MFT and the Town worked together to ensure that the property would remain in agriculture and remain an important scenic site for the local community. The majority of the fields and orchards have been divided between two new farm owners. One buyer from the local community will restore the former pick-your-own apple orchard that he worked in every summer as a teenager growing up in the area. The second buyer will expand the orchards to produce apples for a hard cider operation. Both farm parcels are now protected by conservation easements, which will ensure this productive land remains available for farming and forestry into the future. However, the protection of the orchard parcel was dependent on Three Rivers Land Trust, in cooperation with the Town, acquiring the summit of Goat Hill which will become a local park. The successful purchase of the scenic summit parcel was made possible, in large part by the Town of Acton (pop. 6,000) passing its first-ever bond issue for conservation, and contributing $25,000 from earnings of the Town Forest. Many generous donations from local year round and seasonal residents supported the Land Trust’s contribution. In addition, the Town expects to receive a federal Land and Water Conservation Fund grant to assist with the purchase and the construction of a parking area and universally accessible trail to the hilltop. Both MFT and 3RLT look forward to the restoration of the pick your own orchard, a cider tasting room, and the development of the public park and trail, all of which will ensure that, in the future, Goat Hill will remain a popular and agricultural destination in western York County.